This polish was on my wishlist for a long time, and I saw a lot of people loving it as well, so with my last order I finally got it. But my first impression was hmm, is this what all the fuss was about? 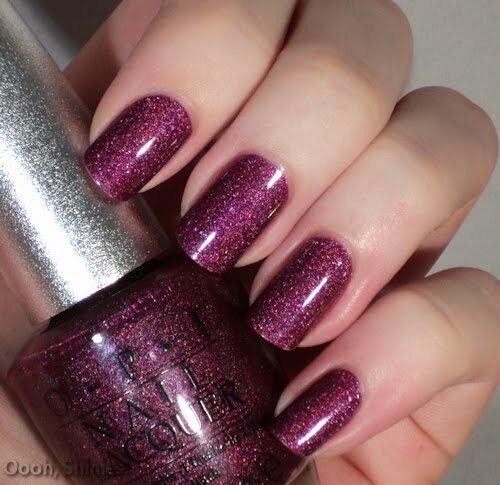 It's a red based purple and the color is definitely pretty, but I'm not too crazy about colored glitter, so with the bottle in my hand I was a bit meh about it. When I put it on that started to change already, the application was very easy. Even though the OPI brush is wider than most of my nails, somehow it wasn't too much of a problem this time (or maybe I'm just starting to handle it better, lol). It went on really smooth, it dried fast as well and it only needed 2 coats. The longer I had it on, the more I started to like it. The fast and easy application and the lovely color also make this a polish I'd wear when I have a lack of time. 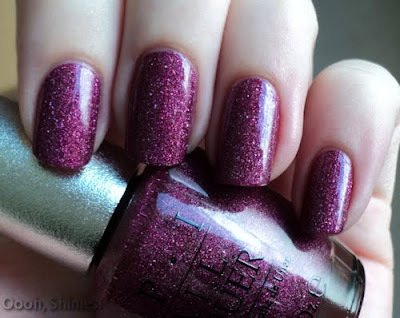 Most of the polishes I use then are holo, and this one is more suited for the fall and winter. I can see myself wearing this a lot! Daylight. Next time I will sandwich it with some top coat and also polish over the tips, because unfortunately it chipped pretty fast. The sun popped up. It's a bit deeper than it shows here, but I didn't have much time before the sun disappeared again.